Hayes & Yeading remain pointless after second half strikes from former United pair Matt Ruby and Richard Pacquette overturned a deserved first half lead for Hayes & Yeading courtesy of a Jake Reid spot kick. Manager Phil Babb made one change in his starting XI with Adam Everitt coming into the side in place of Josh Webb who dropped to the bench. 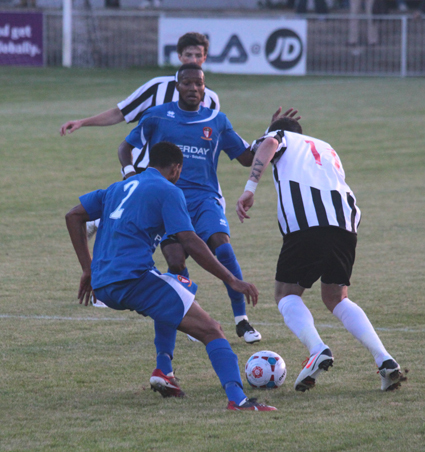 The Magpies started quickly with Mikhael Jaimez-Ruiz in action as early as the fourth minute when Ruby rose highest to a corner but his looping header was held on the line by the United keeper. In the fifteenth minute United had a claim for a penalty waved away as Everitt and Luke Williams combined to send Tom Bird into the box on the left side, Bobby Behzadi caught his heel as he went to shoot and his tame effort did a bit of pinball around the box before falling to Kameron English on the far side but he blasted over. It was only a matter of minutes though before the ball was on the spot when Bird again broke into the area only to be bundled over from behind by Behzadi. Jake Reid stepped up and gave former United reserve keeper Elvijs Putnins no chance. Reid was denied a second just before the half hour mark when his shot on the turn was blocked by Ruby and as the ball made its way to the other end, Pacquette was given too much space to advance on goal, his shot forcing an excellent diving save from Jaimez-Ruiz. Play was soon back down the other end and after English did well to hold off Tom Gilbey on the left, he found Jack Mills who having looked up and seen Putnins off his line tried a 25 yard chip shot that only just cleared the Magpies goal. Both keepers were showing good form as a long ball from defence by Anthony Furlonge found Reid, he outpaced both Gilbey and Ruby only to be denied by Putnins. Play moved rapidly down the left flank towards the United goal and Harry Pritchard cut into the United area only to be denied by Jaimez-Ruiz with Furlonge clearing the loose ball. Five minutes from the break a free-kick by Pritchard dropped in the United six yard box and ricocheted around before going wide of a defenders knee. 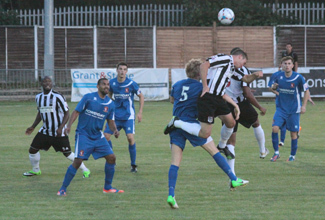 nited started the second half quicker than their hosts with two good chances coming in the first five minutes. Bird fed Williams who having beat Behzadi fired straight at Putnins and then Reid’s cross was left by Williams for Bird to collect and he looked to have found the far corner only to be denied by the fingertips of Putnins that took the ball wide of the post. A double change in personnel by the Magpies seemed to give them more thrust going forwards and the United goal was soon under pressure. Ruby headed a corner wide when well placed and then in the 69th minute a ball in from the right was allowed to land in the six yard box and despite a superb point blank save from Jaimez-Ruiz, Ruby was on hand to smash home the loose ball. Three minutes later the Magpies were ahead, Green played the ball square to Pacquette and the veteran striker picked his spot just inside the post with a perfect curling shot from fully 20 yards giving Jaimez-Ruiz no chance. In the final ten minutes with United pushing more bodies forwards in search of an equaliser, the home side were playing on the break and looking the more likely to score. Jamiez-Ruiz saved well from Pritchard before successive breakaways saw Jaimez-Ruiz beaten firstly by Tony Mendy and minutes later by Wada Ahmidi but on both occasions cover was in behind him and Dean Inman and then Charlie Wassmer cleared off the line. 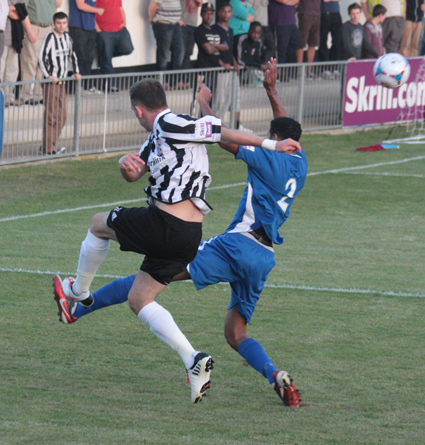 The final chance came United’s way in stoppage time when Furlonge arrived at the far post to meet a Luke Medley cross but he couldn’t keep his header down and the points stayed with the Magpies.